For over 40 years, Vincent’s Den for Men has been serving the Kingsway area of Etobicoke. At Vincent’s it’s simple – a great haircut, in a fun, friendly, comfortable atmosphere. The Vincent’s story began in the early 1970’s, when a barber shop – Vincent’s Den for Men, was founded by Vincent himself. In the early 1980’s, a young John Freda growing up in Etobicoke, was looking for his career path. He decided to try accounting, but quickly realised it was not for him. While spending some time with some hair stylist friends at the local mall, he discovered his calling – hair. He immediately enrolled at Bruno’s School of Hair Design in downtown Toronto. After graduation, John worked in a few local shops in the Bloor/Royal York area of Etobicoke. In 1983, John responded to a job listing in the Toronto Sun for a hair stylist at Vincent’s Den for Men. He went in for the interview and within a few hours, he was on the floor working. In 1989, Vincent decided to sell the business. John was ready to take the next step in his career and decide to buy the shop himself. More than 25 years later, John still owns and runs the shop and his love and energy for hair styling has only grown. He and his experienced team offer great service to both men and women; of all ages. His clients range in age, from as young as 1 year, to those in their 90’s. Many of his clients first came to Vincent’s as children and continued to return to John and his staff as they grew into teenagers, then adults; still continuing to return today. 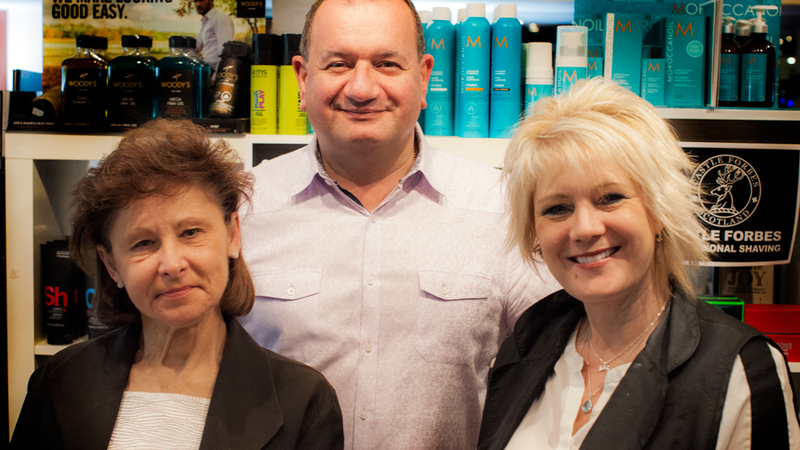 John’s business philosophy is simple – giving his customers a great hair cut, in a comfortable atmosphere. John’s greatest satisfaction comes from making his customers happy. When a client walks in having a bad day, then he or she leaves laughing, John has done his job. When you walk into Vincent’s Den for Men, you are greeted with a friendly smile. While you relax, enjoy a complimentary coffee, espresso, cappuccino, tea, or water. You are then treated to a wash using American Crew hair products; including a scalp stimulating conditioner. All men’s haircuts also include a relaxing, hot lather neck shave. Your experience at Vincent’s is very important to John and the staff. He even plans the music he plays according to the day of the week. On a Monday, he wants to ease you into the week. John wants you to be relaxed, so you will enjoy some nice jazz. By Saturday, John is well into weekend mode. You will find the fun-loving staff at Vincent’s in their jeans, with rock music playing in the background. We want you to feel soothed, we only play music, no televisions. Should you need to connect, not to worry – we offer free WIFI. John likes to have a good time and wants everyone who walks into Vincent’s to enjoy themselves. It is truly about the whole experience. John and his fantastic team have combined their talents and hard work to make Vincent’s what it is today. The staff includes John himself, who specialises in men’s feather razor cuts, as well as 4 other stylists. Full-time stylist Theresa Leja has been with Vincent’s since 1984 and takes pride in her relationships with her clients. Julie Morton has worked with John since 1999 and specialises in women’s cuts, clipper over comb, and fade cuts. Along with part-time stylists Joe and Iris, the staff have been essential contributors to the continued success of Vincent’s Den for Men. Their vast experience combined with their ability to keep current with trends, keeps their clients coming back. Vincent’s has really become a part of the community and is the destination for mens haircut mens hair stylist kingsway etobicoke. Children under 12 and seniors receive an everyday discount. Give your friends and family the gift of a great haircut. Gift certificates are now available in any denomination. Contact Vincent’s Den for Men by phone 416 233 9887 or email to book your appointment today. We are conveniently located in the Humbertown Shopping Centre, with plenty of free parking – 270 The Kingsway, unit #58. Vincent’s Den for Men accepts all major credit cards – Visa, Mastercard, AMEX, Interac Direct Payment, and cash.